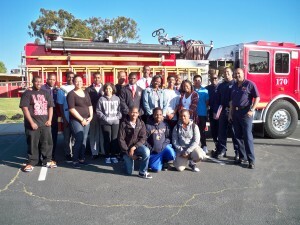 The Junior Firefighter Youth Foundation is the educational and school based programming component of the African American Firefighter Museum. It was founded in 2003, by Captain Brent Burton, a 28-year veteran of the Los Angeles County Fire Department. In 2014, the Foundation removed it’s status as a non-profit and moved under the Museum’s non-profit arm. The Foundation works on the campus of several elementary and high schools. 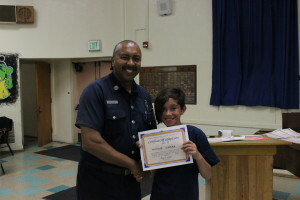 Providing a Junior Fire Cadet Program and Future Firefighter Program. 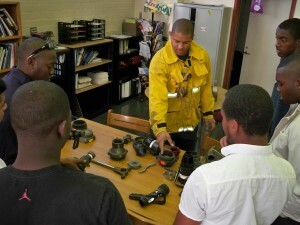 Is to mentor, train and develop young minds for the future. We provide educational lectures and exercises that stimulate young minds to make better choices so they can become productive citizens. The Junior Fire Cadet program (JFC) is the signature program of the Junior Firefighter Youth Foundation. The JFC program was first created by Captain Kwame Cooper of the Los Angeles City Fire Department in 1995. 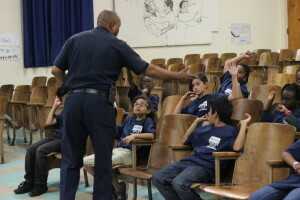 This program was very successful at a local Mid-City section elementary school in Los Angeles. With the assistance of Principal Anna McClinn of the Marvin Avenue Elementary school and the members of LAFD Fire Station 68, youngsters in the 4th and 5th grade received more than an education. They received a skill set they will never forget. 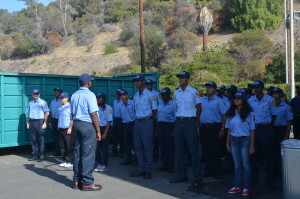 In 2001, the Stentorians of Los Angeles County used this idea to create the new Junior Fire Cadet program. 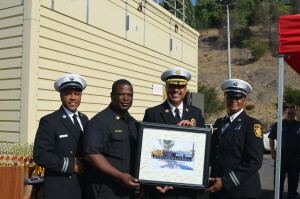 Captain Brent Burton of the Los Angeles County Fire Department and then President of the County Stentorians, utilized L.A. County Fire Stentorian resources to run this successful program. 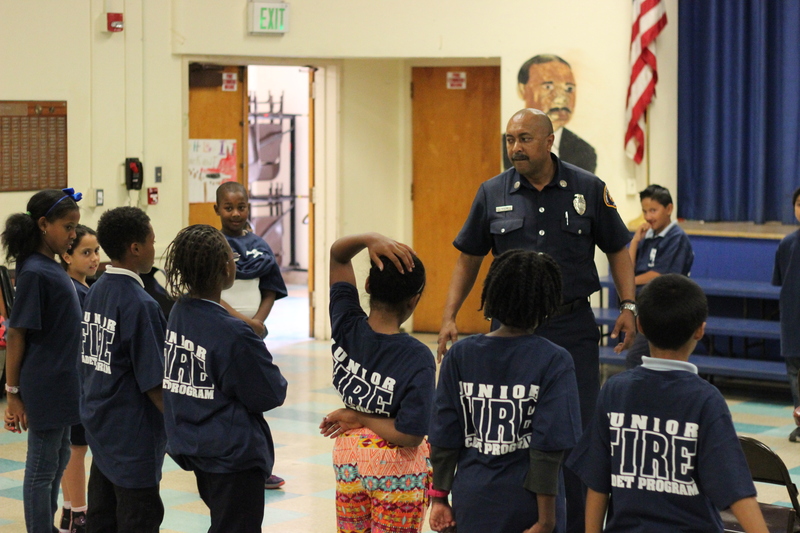 This program was first partnered at the Tom Bradley elementary school in Leimert Park with Mrs. Sharon Dean, Bradley Healthy Start program coordinator. Since 2001, the program has served over 400 elementary school students in 5 different elementary schools. 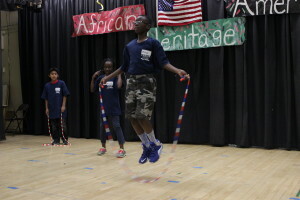 The JFC program is a six-week program that meets once a week for one hour a day on the campus of selected elementary schools. 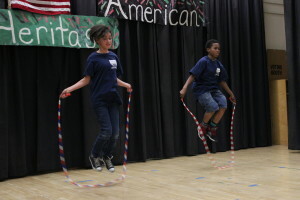 The program targets 4th & 5th grade students. 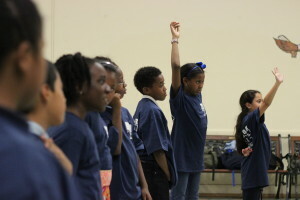 The students are provided with a t-shirt and notebook. 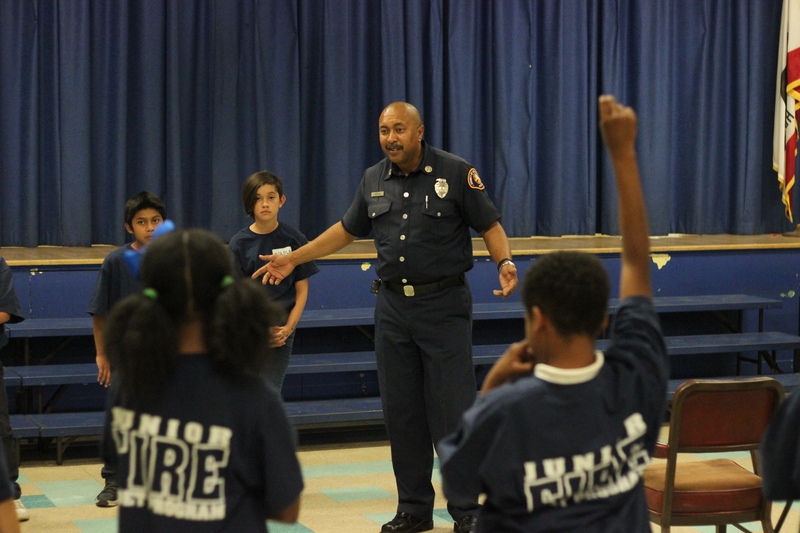 The youngsters learn about Fire Department operations, Fire Safety education, discipline, the value of physical fitness and staying in shape. Students also learn about civics and the importance of becoming a voter and staying civically involved in their community. 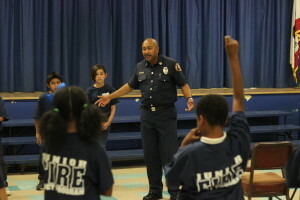 Guest speakers are brought in to discuss personal development and basic life survival skills. 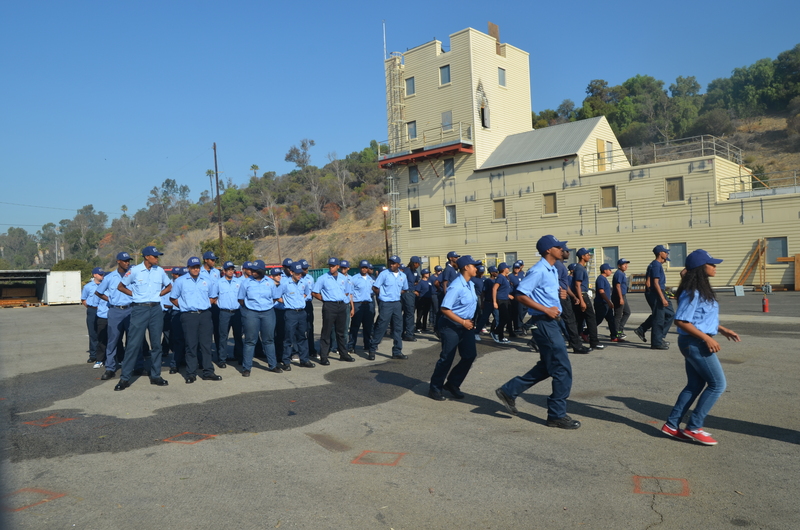 Police officers from the Los Angeles Police Department are also utilized to demonstrate what is expected from the students if they ever happen to have an encounter with a Police Officer. 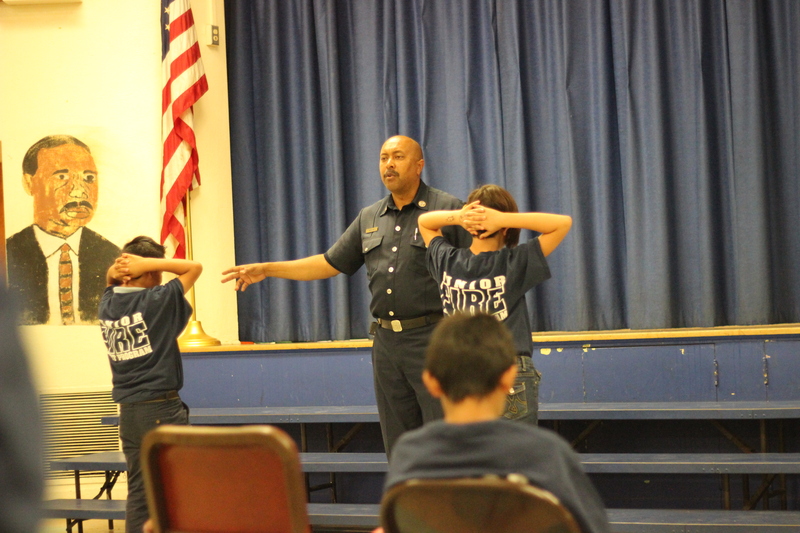 At the end of the six week program the students will understand basic fire safety principles, how the fire department operates and how important physical fitness is for them as they prepare to enter middle school and the strict physical education requirements that are taught. The students are presented with certificates of completion and receive recognition for their efforts and hard work. 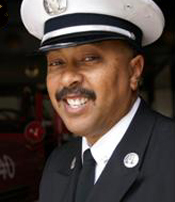 The JFC program is an extension of the Junior Firefighter Youth Foundation (JRFFYF), a non-profit community based organization that was founded by Captain Brent Burton, President of the African American Firefighter Museum. 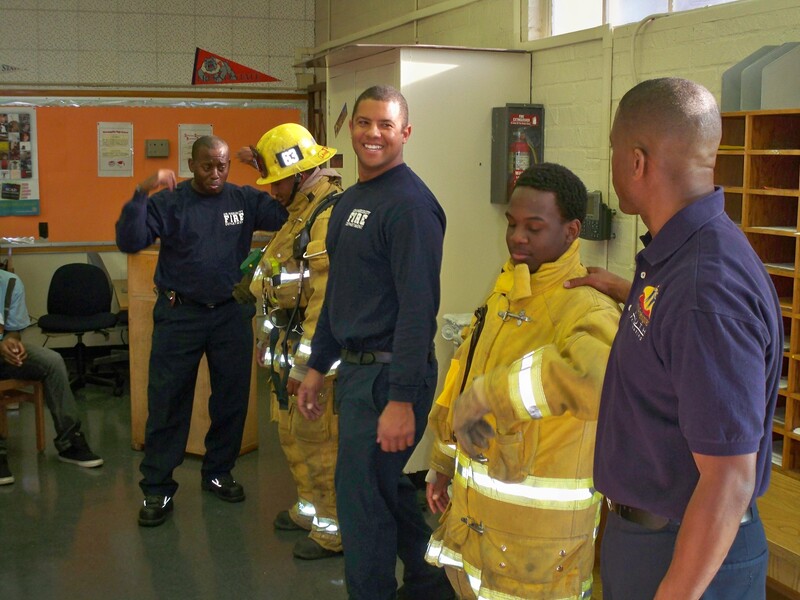 The program utilizes off duty firefighters as positive male mentor role models to address the children and share with them the lessons that were learned by these firefighters when they were growing up in Los Angeles. Other programs offered by the JRFFYF are career day speakers, live fire department demonstrations with personal protective safety gear, presentations on fire safety education, disaster preparedness and the history of African Americans in the Fire Service. To request our services, please click on the contact us button and submit your information. We will respond back to you at our earliest convenience. 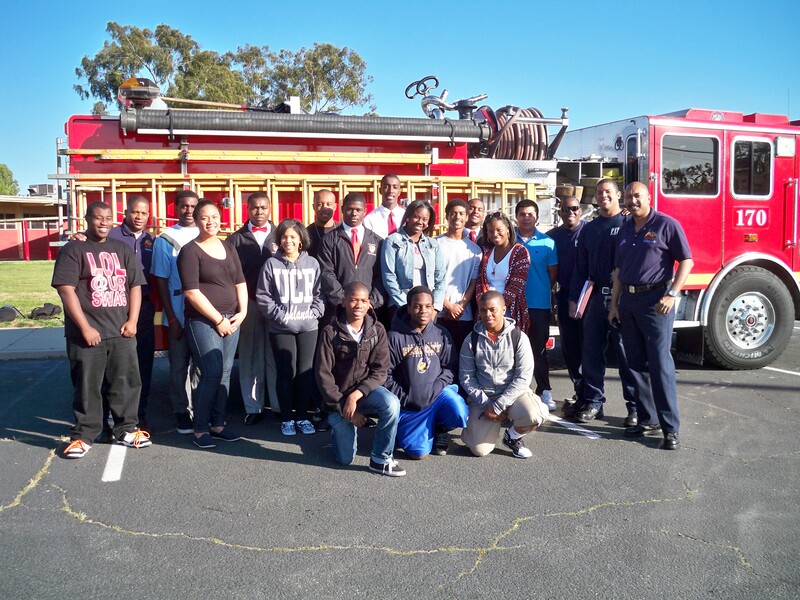 The objective of the “Future Firefighter Program” is to introduce Middle and High School students to the fire service community. 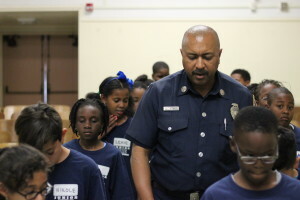 Many of the topics discussed will address the choices they make as well as other subjects and issues they will face as middle and high school students and young adults. 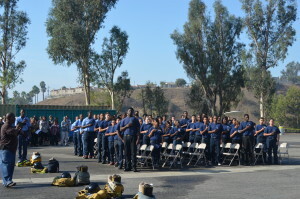 The Program will attempt to expose the students to the outside world of local government and community service and help them become the leaders we know they can be. The Future Firefighter Program was created in 2011 on the campus of Morningside High School in Inglewood Calif. by Captain Brent Burton, founder and CEO of the Junior Firefighter Youth Foundation and a 27 year veteran of the Los Angeles County Fire Department. The administration of Morningside High was very supportive and open to this new idea. 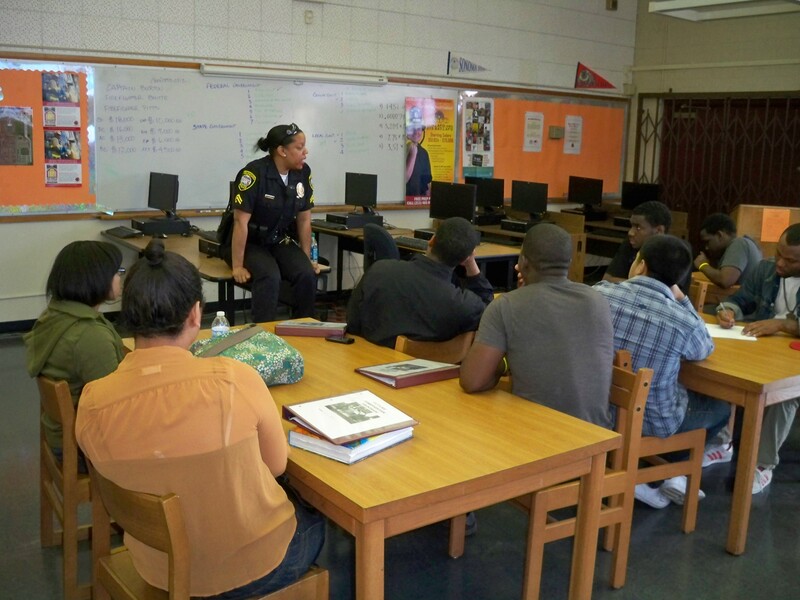 Captain Burton felt the need to expose High School students to positive men and women that work in the areas of public safety and local government. 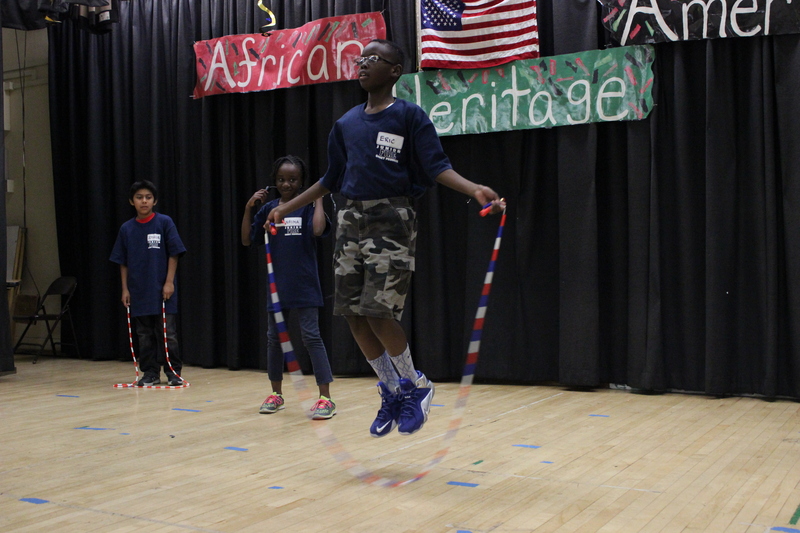 An average of 10 students attended the 10 week after school program for an hour and half once a week. 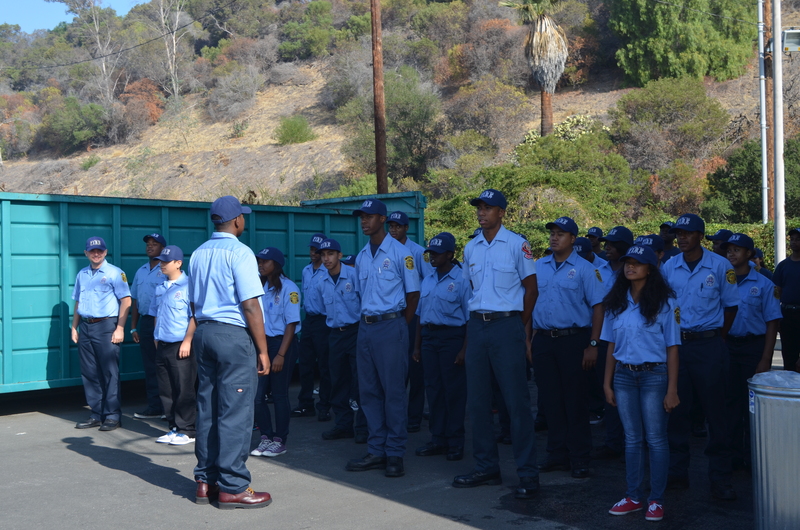 The program consists of 30% fire department information and 70% life skills. The goal is exposure, preparation and survival. Assisting Captain Burton are the members of the F.I.R.E. team. Firefighters Instilling Responsibility through Education. 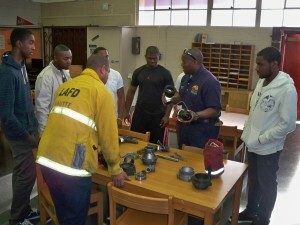 These are dedicated and caring firefighters that give their off duty time instructing the students. 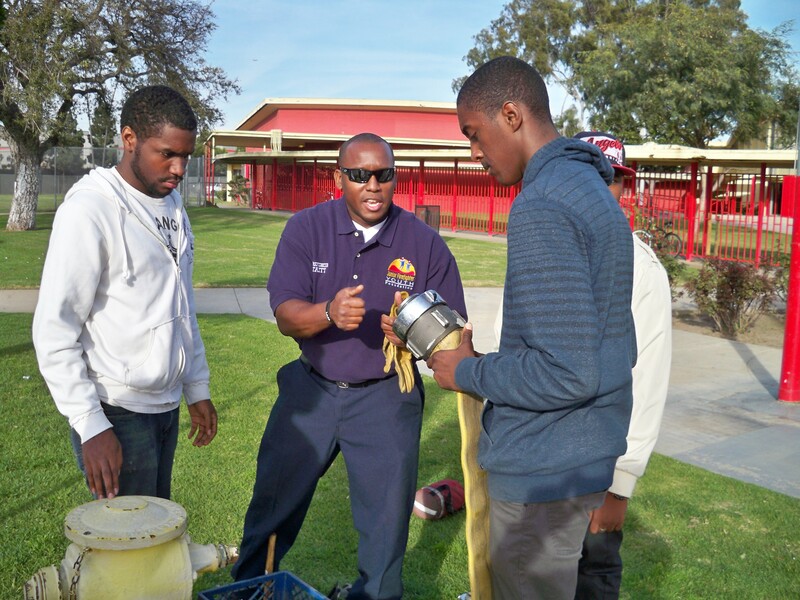 To learn more about the Future Firefighter Program for Middle and High Schools, please contact Captain Burton through the contact us link on our website. 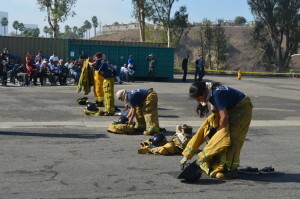 High School students attend for 5 Saturdays and taught basic hands on firefighter techniques and skills. 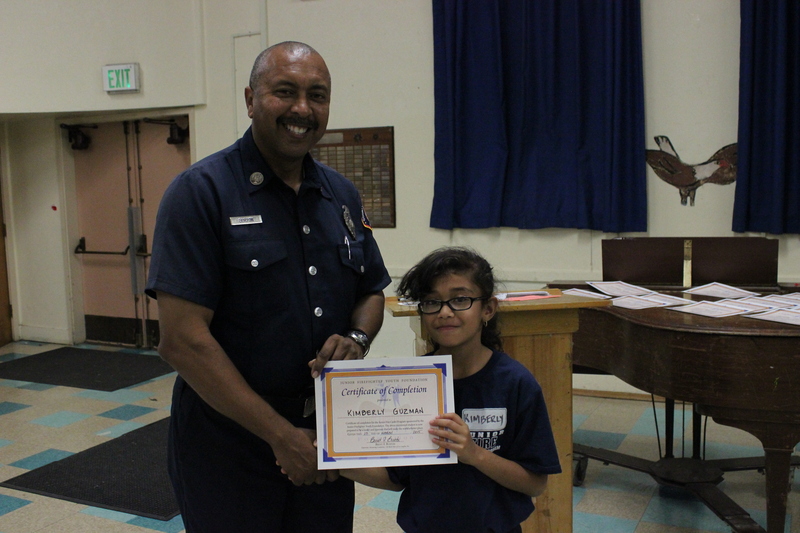 So far several of our Future Firefighter Program students have attended and received awards for their achievement. 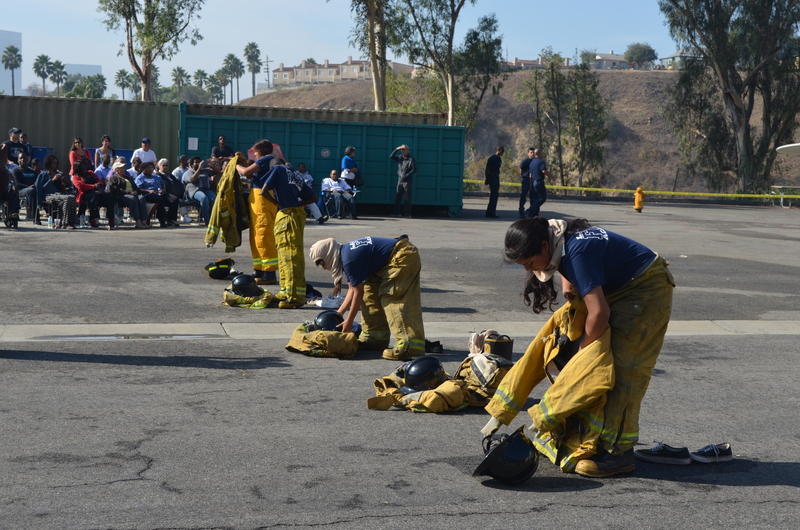 We support sending our Future Firefighter Program students to the Los Angeles Metro High School Fire Academy. The High School Fire Academy is coordinated by LAFD Battalion Chief Antoine McKnight in conjunction the Los Angeles Fire Department. It is held on the campus of the Frank Hotchkins Memorial Training Site in Elysian Park near Dodger Stadium.